The DAF’s truck range has a good reputation among drivers, earned thanks to its high fuel efficiency and the small maintenance costs. The DAF CF is a highly versatile truck that comes with high payloads and a wide choice of cabs and axle configurations. Three cabs are available for the CF range which includes the Day cab, Sleeper cab and space cab. The CF series is available in many different axle configurations, ranging from two-axle tractors and rigids to three- or four-axle vehicles, single- or double driven. 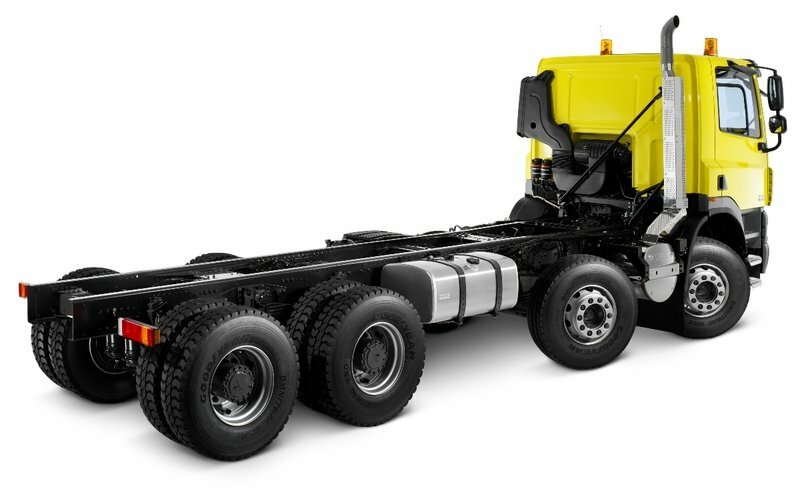 The truck is equipped with the highly efficient PACCAR engines and features a lightweight chassis which is suited for a wide range of applications. The DAF’s design may not be the most attractive in its segment but it copes well with the heavy duty nature of the truck. The vehicle has an imposing stance highlighted by the big rectangular grille which is decorated with two horizontal strips painted in body color. The lower grille features a V shape that flows towards the number plate forming an attractive pattern which underlines the rough character of the truck. The bumper is painted in the same colour as the cabin and features two thin deadlights which look a bit to small compared to the overall size of the cabin. The chassis shape was designed to minimize vehicle weight and maximize available space. Many components, such as air tanks and other brake components, are mounted on the inside of the chassis frame, leaving ample space for the fitment of crane legs, twist locks, hydraulic tanks, tool boxes and other additional equipment. The truck’s versatility is also enhanced by the numerous axle configurations which come in 4x2, 6x2, 6x4, 8x2 and 8x4 shapes. The CF Series also includes a special FTP tractor version with a lightweight pusher axle with 17.5 inch wheels to prevent overloading of the driven axle. Climbing up into the big sleeper cab is made easy as the grab handles are mounted in excellent positions either side of the door opening. The overall design isn’t as catchy as other trucks in the segment, but we don’t have any complains about the overall ergonomy and despite the cluttered dash, most of the controls have logical positions and are easy to use. The parking brake is located on the dashboard, thus clearing the floor area nicely. On the other hand the build quality isn’t something to rave about and it can’t be compared with models like Mercedes or Volvo. The driving position however is fairly good and we also like the supportive seats which can be adjusted in many ways permitting you to find a perfect position. Thanks to their egomaniacal configuration and the two way adjustable steering wheel you won’t have any problems in spending a full day on the road. The multifunctional steering wheel is fitted with controls for fuel consumption, trip times, engine faults, radio volume, and hands-free phone capability. As most of today’s trucks the road visibility is also top notch and the heated and electric mirror are positioned well allowing good vision. There are also a lot of generous and practical storage facilities for all three cab configurations. The Day Cab has lockable tray and cup holder on the engine tunnel and a few storage boxes above the windscreen. The Sleeper Cab features storage space under the lower bunk while the underbunk storage locker is accessible from the outside only. The roomy Space Cab offers standing height on the engine tunnel, extensive storage space, including large illuminated lockers above the windscreen and room for home comforts like a TV, refrigerator and microwave. The CF Sleeper Cab is fitted with a full-size one-piece bunk that is 205cm long, 70cm wide and 12cm thick. The bunk is also available in a raised position, offering a comfortable place to sit and extra under-bunk storage space for an optional refrigerator. In the Space Cab, the raised bed is standard while a there is also available an optional second bed over 2 metres long and 70cm wide. 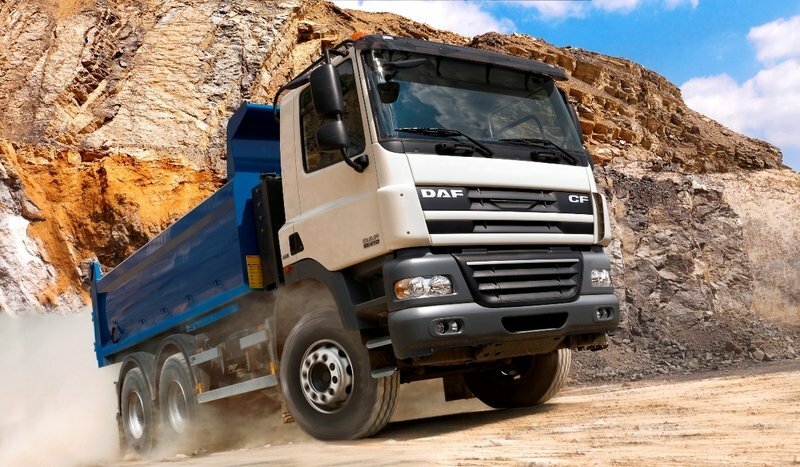 The DAF CF65 is equipped with the 6.7 litre PACCAR GR engine while the CF75 model comes with a 9.2 litre PACCAR PR engine and the CF85 is powered by the 12.9 litre PACCAR MX unit which is borrowed from the bigger XF105 model. With power ratings between 220 hp- 510 hp the engines are equipped with DAF SCR Technology to be more fuel efficient. 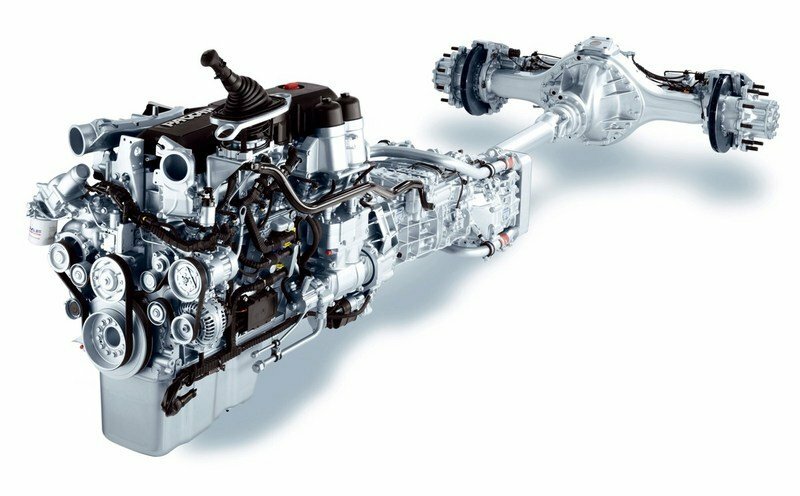 The 6-cylinder Euro 5, in-line engines with SMART high-pressure injection systems are the most efficient in the CF range and deliver high power and torque at low engine speeds with maximum service intervals of 55.000 km. The 9.2 litre PACCAR PR engine in is also Euro 5 compliant and has the service intervals set at 100,000 km. The 12.9 litre PACCAR MX engine is the strongest unit in the lineup and has service intervals than can go up to 150,000 km. The DAF CF65 offers a choice of six- or nine-speed manual transmissions. The CF75 and CF85 models are available with eight-, nine-, twelve- and sixteen-speed manual transmissions. For all models there is also available an optional pneumatically controlled Servoshift which offer a smoother gear selection. 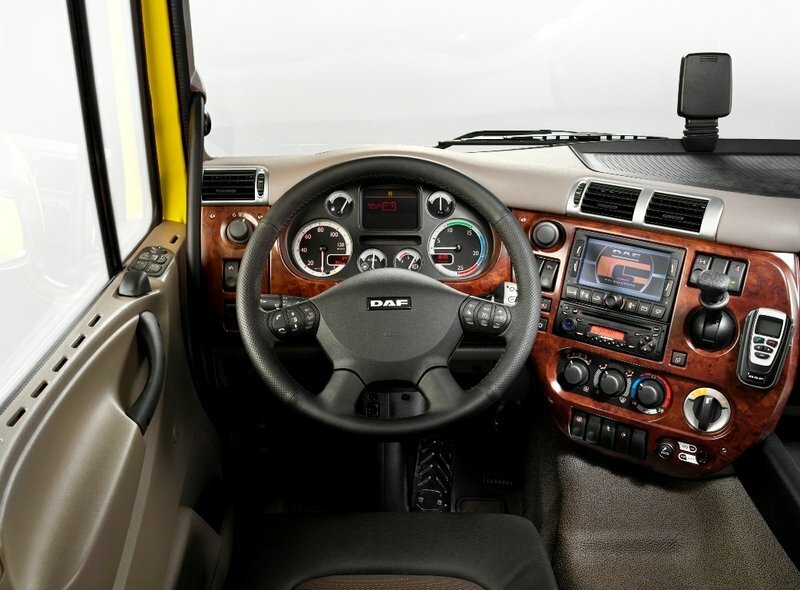 The truck is also available with the optional automated AS-Tronic gearboxes. The automated gearbox gives better fuel consumption and also offers the possibility to change gears manually without using a clutch. The DAF CF range is available with either parabolic springs or electronically controlled air suspension on the front and rear axle. Conventional leaf springs are also available for exceptionally demanding applications. The 6 x 4 and 8 x 4 models come with the 8-rod tandem suspension which offers high articulation, excellent traction and a high roll centre. Besides the engine brake the truck is also fitted with all around disc brakes combined with EBS, ABS. Moreover, the truck is also available with Anti-Slip Reduction (ASR), Brake Assist, and Vehicle Stability Control (VSC). Thanks to all these electrical nannies the truck is permanently kept in check and the rissls of jack-knifing and skidding are kept to a minimum level. The CF’s power assisted system delivers good feedback and the handling is pretty predictable even for the long wheelbase models. The straight line stability is also pretty accurate but compared to other trucks in the segment, there are a few corrections needed from time to time in order to keep the truck in check. 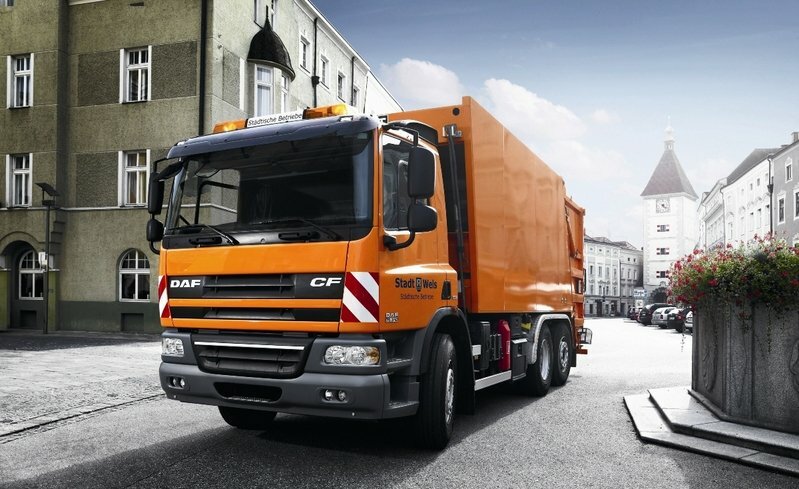 The DAF CF offers a great value for money and is among the most versatile series in the segment. The truck may not be as reliable as a Volvo or Mercedes, but its fuel efficiency is among the best in the segment. The cabin comfort is also satisfactory and even if you’ll find a better build quality at some of its rivals, the overall layout is pretty practical and the controls are placed within easy reach. It’s also very clear that the DAF engineers have spent a lot of time in finding an optimally match between chassis design, steering, brakes and suspension, as the truck handles without faults.